Sansum has been providing only the very best materials to our customers since we were first established in 1972. Our range of products includes decorative gravel, block paving, building aggregates, paving and patio slabs, edgings, fencing, sports surfacing, topsoil/compost/bark, building products, drainage, and tools. We take great pride in the products we sell and are always willing to help you find exactly what you’re looking for. Just ask our friendly and knowledgeable staff, who are always happy to provide assistance. Do not hesitate to contact us for advice and information on 01793 536784. It is very important to us that we keep up with our customers’ needs and always have the knowledge to answer any questions. This is why we always ensure we are up to date with any industry news. If you are also a keen gardener, then read this short summary of some of the news articles that caught our attention. Installing a full working kitchen outside is the next step in the wider trend of making al fresco rooms that are more liveable all year round. 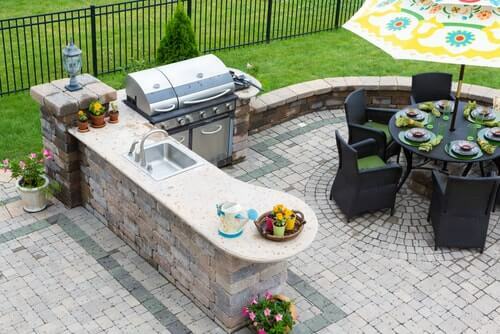 At the top of the market, garden cooking and entertaining areas “have overtaken swimming pools and tennis courts as the first thing people do to add value and extend the use of an outdoor space,” according to Craig Ormiston, who represents American outdoor kitchen company Fire Magic in the UK. The rise in entertaining at home is driving the trend: these aren’t just spaces to cook, but somewhere to have fun doing so, with all your friends joining in. In that way, it mirrors developments in indoor kitchens, with island units and breakfast bars that are designed to create a sociable space. Rhiannon Williams, a landscape architect of Landform Consultants, took inspiration from the garden bar at Barcelona’s Hotel Alma for a garden she designed at this year’s RHS Hampton Court Show. “The point was to show that you don’t need a huge space to entertain outside,” she says. Her design includes a compact bar, with a wine fridge and prep area. If you don’t have space for a full kitchen but still want a good-looking centrepiece for the garden that you can cook on, try some of the new hybrid wood-burners/barbecues. Designer looks meet practicality in products such as Chesney’s’ Heat 500, or Morsø’s Forno outdoor oven (which now comes in a gas version, too). Wooden Decking or a Stone Patio? A patio tends to add more value to a property than decking because it is more permanent and needs less maintenance. But if you’re installing something with a view to selling, decking might be cheaper and look better for the first year or two. Patios and decking have their pros and cons which you need to weigh up before choosing one over the other. The character and style of your home should also have an impact on your decision, as well as your budget and timescale. Patios: A good quality paved patio is easy to maintain and should be built to last a lifetime. A trip to your local DIY store will show that there are lots of choices to suit all tastes, so there should be a patio to suit you. Patios work well with all sorts of properties, both period and new-build. The biggest downside to a patio is cost. They can be very expensive, depending on the materials, the size of the patio and the quality of the stone. There is also a lot more work involved with a patio than if you were laying decking. Underneath the patio itself, more construction is required, particularly if you have soft soil, which needs reinforcing, and a concrete base. Decking: Whereas stone patios have been around forever, decking is relatively new to the UK, but even so it has become ubiquitous in a short time. It has grown in popularity so quickly because it is usually far cheaper than a patio, even if you use the best quality timber because there tends to be less ground preparation. It is easier to lay and therefore quicker to install than a patio, particularly if it is raised above ground level. Wood also looks more natural than paving stones, so it may fit your garden better or the style of your house. Decking drains easily so after a shower on a sunny day it will dry quickly, but it can be very slippery in wet weather. 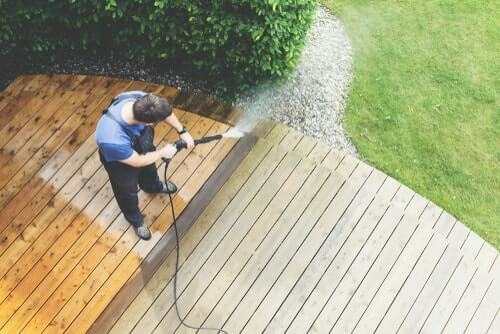 Decking requires quite a lot of maintenance, such as regular oiling every couple of years, and softwood may not last as long as a patio, so it will need replacing in a few years. Warped decking that hasn’t been cared for will not add to the appeal of your garden. There’s nothing like the sound of water to take the heat out of a city garden, and this summer we’ve craved it more than ever. 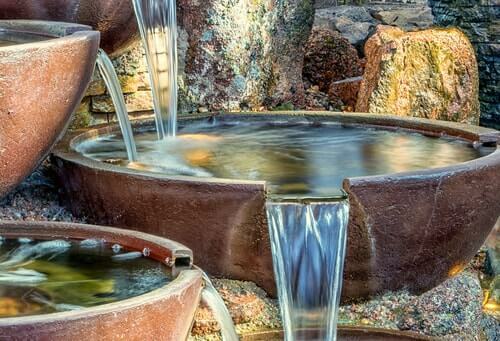 Even a simple wall fountain can make you feel cooler and reduce the temperature of the air around it. London garden designer Stuart Craine works wonders with water, from pebble moats surrounding “floating” terraces to shiny water walls for roof gardens. If you want to hop on these trends and fancy installing an outside kitchen, patio or decking, or a cooling and relaxing water feature, there are several materials and tools you may need. Sansum provides these materials and tools at the highest quality for the best price. We also provide a collection and delivery service within the Swindon area. If you are interested in our services, do not hesitate to contact us on 01793 536784 to find out more.